Pack your bags for an unforgettable wilderness escape at this cozy 3-bedroom, 1-bathroom Tellico Plains vacation rental cabin! 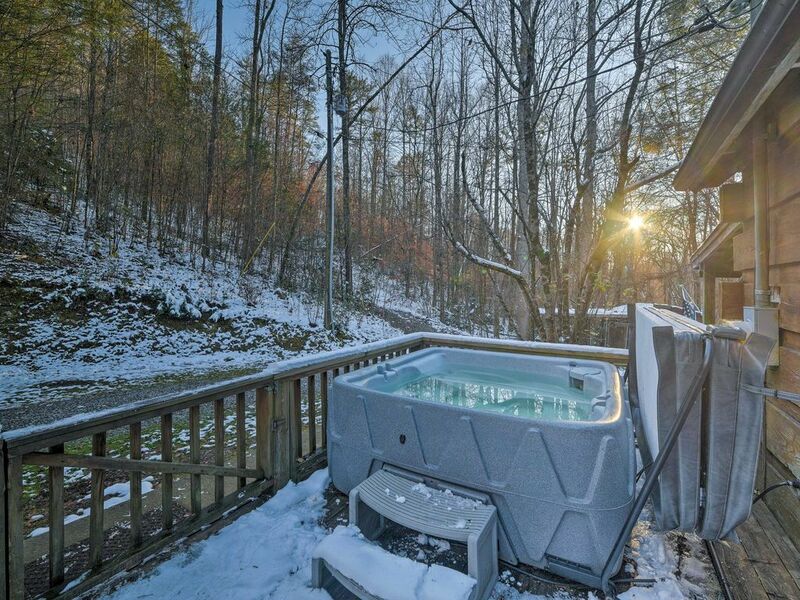 With a hot tub, game room, and sleeping for 6, this home is the ideal retreat for families and friends. Ideally situated on 25 acres of breathtaking natural beauty, this home offers easy access to outdoor activities such fishing on Coker Creek! The park in front of the cabin is perfect for hosting picnics and barbecues while listening to the flowing mountain creek. Rustic furnishings and a stone mantle fireplace invite you into the warm living space, offering all the comforts of home. A flat-screen cable TV and DVD collection with nearly 400 movies make the living room the perfect place to unwind after a day outdoors. During downtime, head to the game room featuring an air hockey table and Foosball table, go fishing in Coker Creek right outside, or simply lounge on the porch and soak up the beautiful scenery. In front of the property, you'll find an eating area and campfire for roasting marshmallows on chilly evenings! Prepare your favorite wholesome meals in the well-equipped kitchen or outside on the gas grill! With a 4-person dining table and seating arrangements on the covered deck, there's plenty of space to savor meals with your travel companions! After a day of exploring the area, retreat to the master bedroom for a replenishing night's sleep. Additional accommodations can be found in the remaining 2 bedrooms, hosting 2 twin beds and a daybed that can be converted into a king-sized bed. TVs in every room will make falling asleep easy. Wake up in the morning after a refreshing night of sleep and enjoy your coffee while sitting on the front porch swing. Listening to the water flow over the rocks in the creek is the best way to start off your day! With its incredible location on 25 private acres and next to Coker Creek, you'll have a hard time leaving the cabin! Grab your swimsuit, fishing pole, and hiking shoes to take on all the outdoor splendors of the property. Take a short stroll down to the park alongside the creek and enjoy a nice meal while listening to the water. The park has a picnic table, fire ring, and a B.B. stationary charcoal grill for making your grilling your favorite meats and veggies! The cabin also grants easy access to several other outdoor activities, such as horseback riding, mountain biking, and zip lining. For a day trip, venture into the Cherokee National Forest, go fly fishing on the Tellico River, or hike the magnificent Bald River Falls! If you want to unveil the area's unrivaled scenery without much effort, take a scenic drive along the Cherohala Skyway, offering several overlooks where you can stop to enjoy the sites. You can also access many other popular destinations within a short drive, such as Pigeon Forge, Sevierville and Gatlinburg! - Amenities include a well-equipped kitchen, flat-screen cable TVs, 400-movie collection, DVD player, gas fireplace, free WiFi, central heating and air conditioning, ceiling fans, gas grill, 2 dog kennels, a hot tub, furnished deck, driveway parking, and much more! - Private Tellico Plains Location - An array of outdoor activities right outside your door and minutes from several area attractions! Really enjoyed this place. Everything worked, hot tub, fireplace. Great place to go too get away. Had plenty of room for a large family or friends to hang out. Was clean and had everything needed for cooking. Would recommend and stay again. Really enjoyed our time with long-distance family at this beautiful cabin! Right beside the Skyway, which has awesome views! Cabin was perfect for everyone to have their own personal space and hang out as a family. Our two dogs loved the creek and getting to swim and explore there. Property was clean and off the beaten path but no grocery stoors close by and very few good paces to eat! Quiet and peaceful. Beautiful cabin, exactly as advertised. As someone who is afraid of heights, the wind road (Hwy 68), and the bridge access were a little scary. My minivan bottomed out at the turnoff, and both sides of the access bridge, but I learned quickly to take it real slow. This cabin had everything we needed and so many thoughtful touches. The fire pit and picnic table by the creek right beside the cabin was so nice to have. I'd recommend staying here.